This past week (August 28, 2013) I attended an exhibit of works of the Chinese artist, Ai Weiwei, at the Art Gallery of Ontario (AGO) in Toronto. I urge anyone reading this who lives in the Toronto area to go and see it. 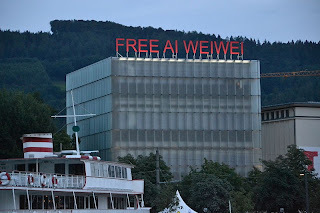 Ai Weiwei is not only an artist, he is also a human rights activist who has taken considerable risks in order to protest rights-abusive actions of the Chinese government. One of his exhibits, in fact, is an enlarged photograph of a brain hemorrhage he sustained after being hit by a policeman; fortunately, he was on his way to Munich when this happened and was hospitalized and treated there. He is currently not allowed to leave China. The exhibit opens with a large set of photographs Ai Weiwei took of devastated lands expropriated by the government to permit construction of new buildings. Since all land in China belongs officially to the government, people whose homes or small businesses are destroyed don’t have the right to protest. This violates both the right to housing and the right to property. Another set of photographs is of the famous “Bird’s Nest” Stadium, built for the 2008 Olympics in Beijing, which Ai had helped to design. He refused to be involved further in Olympic propaganda, however, once he realized that people were being arbitrarily displaced in order to provide room for the Olympics. Many of the displaced were “illegal” (unauthorized) internal migrants to Beijing from other parts of China. All Chinese must take part in the household registration system, a form of internal passports. Migrants to Beijing who don’t have official permission to live there lack many fundamental rights; for example, many of their children can’t attend school. Ai Weiwei was also horrified by the death toll from the 2008 earthquake in the region of Chengdu. An estimated 90,000 people died, including thousands of school children who perished in the shoddily-constructed, government-built schools. Against the wishes of the authorities, Ai assembled a team of researchers who eventually accumulated names, ages, and other information about 5,186 school children. One of the most moving pieces in the exhibit was a wall installation of all the names and other information about the children. Although I do not read Chinese, I was still moved by the columns of birth dates of those who died. Also, Ai had used Twitter to teach people all over the world willing to read out the names of the dead, so as I read the birthdates, I heard a recording of voices—often those of children—reading the names. Ai weiwei thinks naming the dead is important: a quote from him about the installation read “A name is the first and final marker of individual rights, one fixed part of the ever-changing human world. A name is the most basic characteristic of our human rights; no matter how poor or how rich, all living people have a name, and it is endowed with good wishes, the expectant blessings of kindness and virtue.” If we name the dead, we bring them back to life and remove them from the unfathomable multitudes, the millions who die. Ai’s installation reminded me of an exhibit on Cambodia I saw in the University of Connecticut Museum in 2001, with pictures of some of the 20,000 people—many children—tortured and then murdered in the Tuol Sleng prison in Phnom Penh during the reign of the Khmer Rouge from 1975 to 1979. These people remained nameless, but their faces reminded us of their individuality. Since the United Nations’ Conference on Human Rights in Vienna in 1993, the official line of the human rights establishment has been that all human rights—civil, political, economic, social, and cultural—are interdependent and indivisible. Certainly this is something I’ve been arguing for a long time. It seems that there is more than one path to “development,” considered merely as economic growth. One path was the messy model whereby Western Europe and North America became wealthier and freer, eventually—after much struggle by--protecting most human rights for most citizens most of the time. The other path is the East Asian model, where economic growth eased the lives of many people while the governments—as in South Korea until the late 1980s—remained dictatorial. China is definitely much wealthier than it was before it turned to state-organized capitalism in 1978, and many Chinese people live much easier lives than did their parents under communism. 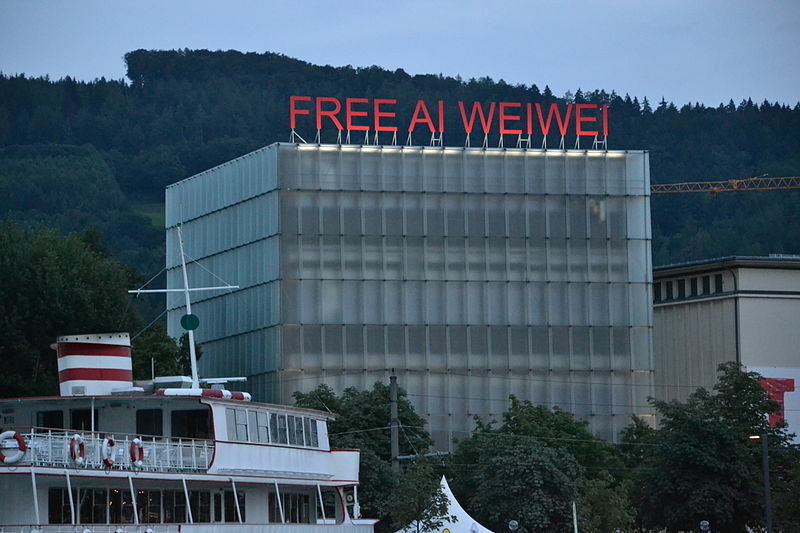 But as Ai Weiwei shows, without property rights the state can take away your home. Without freedom of speech, freedom of the press, and freedom of assembly, the state can construct shoddy schools in which your children may die, and you can’t do anything about it. Without artists like Ai Weiwei—as the Chinese government knows full well—it is difficult to represent their own suffering to the Chinese people. 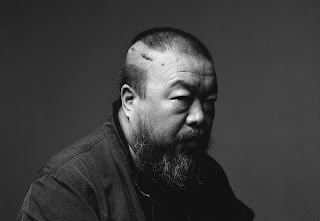 Ai Weiwei’s is an extremely powerful voice for freedom in China. There was one discordant note in this exhibit. The souvenir shop attached to it was selling small books of reproductions of Chinese government propaganda posters. I’m not sure what to think of that: I know that propaganda posters can be considered art that is interesting in its own right, but it seemed as if the Art Gallery of Ontario hadn’t got Ai Weiwei’s message at all.